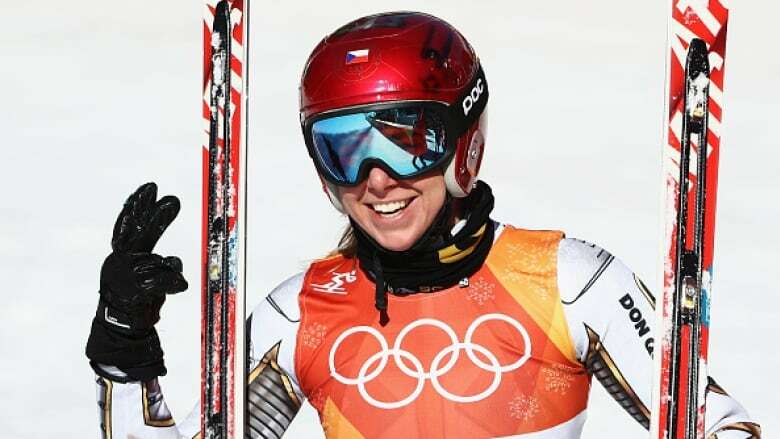 Ester Ledecka of the Czech Republic has made a stunning run from back in the pack to take the Olympic super-G title, with a mistake costing Lindsey Vonn a spot on the podium. Ester Ledecka stepped out of her snowboard long enough to click into her skis and become a most unlikely Olympic gold medallist. Even the 22-year-old from the Czech Republic who dabbles in both sports can't quite believe it. Ledecka made a stunning run to take the super-G title on Saturday at the Olympics in Pyeongchang, with a mistake costing Lindsey Vonn a spot on the podium. "'Til today, I thought I am a better snowboarder," Ledecka said. Three Canadians competed in this event, but none were able to crack the top 20. Valerie Grenier of Mont-Tremblant, Que., finished 23rd at 1:22.77. Toronto's Candace Crawford and Roni Remme ended in 29th and 37th, respectively. Even better may be this: Is she now a snowboarder or an Alpine skier? Ledecka didn't blow anyone away in any particular section along the winding course, but she was consistent throughout her run. That didn't surprise her snowboarding coach, Justin Reiter, who competed for the U.S. in snowboarding at the 2014 Sochi Olympics. "Every time she pulls out of the start gate, she pulls out with a fire behind her and inside of her," Reiter said. "I didn't know that this would be her first skiing podium. I knew it was possible, but I didn't expect it." He wasn't alone. Her winning run shook up what looked like a set leaderboard — knocking Lara Gut of Switzerland off the podium. "I love this surprise that sports can provide," said Sofia Goggia of Italy, who finished 11th. "I knew [Ledecka] is a really great skier because she has so many fast parts in the training, but she never put it all together. And today she did. I am happy for her and I am kind of surprised." Turns out, Ledecka's first sport was hockey , which was no surprise given her grandfather, Jan Klapac, won two Olympic medals in hockey for Czechoslovakia in 1964 and 1968. She then started skiing at the age of 4 before switching to freestyle snowboarding and eventually Alpine snowboarding and is now back to skis. Throughout her snowboarding career, she's been skiing on her off days. She narrowly missed qualifying for the Czech ski team for the Sochi Games. In snowboarding, though, she placed sixth in the parallel slalom and seventh in GS. "I am so surprised about all of it," Ledecka said. "I'm really trying to win and do a good run every time, but I didn't really realize that this really can happen." "I'm not sure which skis I'm using," Ledecka said at her news conference. "I hope mine." "I would rather go riding my snowboard now," Ledecka said, laughing. "I thought it was either going to be really great or really bad," Vonn said. "And it didn't quite turn out the way I'd hoped. I didn't really have a choice in the matter so I did the best that I could. "Just made one mistake, and that cost me a medal." Vonn dedicated these Olympics to her grandfather, Don Kildow, who died in November. On Friday night, Vonn said on her Twitter account : "I will give it everything I have with no regrets. This is for my Grandpa!" Vonn will have another shot to medal in the downhill. At 33, she is trying to become the oldest woman to win an Olympic Alpine medal. She won bronze in the super-G at the 2010 Vancouver Games — to go with her downhill gold — but missed the Sochi Olympics after surgery on her right knee.